This tutorial covers the steps for computing confidence intervals for the difference between two proportions in StatCrunch. 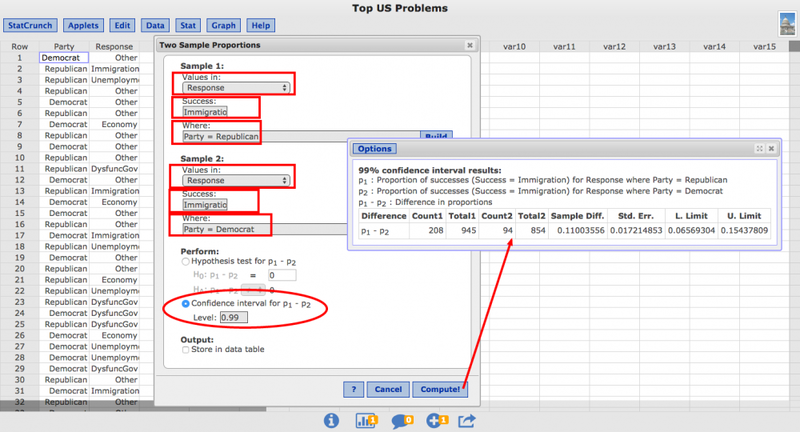 To begin, load the Top US Problems data set, which will be used throughout this tutorial. This data set comes from a Gallup survey taken in July and August 2014 which asked 945 Republicans and 854 Democrats to name the biggest problem for the United States. The Party column contains the respondent's party affiliation, either Republican or Democrat. The Response column contains the top problem identified by the respondent. Only the top four responses are tabulated here: Immigration, Dysfunctional Government, Economy and Unemployment. The remaining responses are listed as Other. To compare two proportions using the corresponding summary data, see Computing confidence intervals for the difference between two proportions with summary data. A confidence interval can be calculated for the difference between the proportion of Republicans and the proportion of Democrats that identify "Immigration" as the top problem. Choose the Stat > Proportion Stats > Two Sample > With Data menu option. Select the Response column for Values in under both Sample 1 and Sample 2. The Success input is used to define the outcome of interest. In this case, set this value to Immigration under both Sample1 and Sample2. For Sample1, set Where to Party = Republican to limit the respondents in the first sample to Republicans. For Sample2, set Where to Party = Democrat to limit the respondents in the second sample to Democrats. Make sure to type this statement accurately as such expressions are case sensitive. These statements can also be created by clicking on the adjoining Build buttons, which opens a custom expression builder. Under Perform, choose Confidence interval for p1 - p2. By default, StatCrunch has a value of 0.95 for the Level input which will produce a 95% confidence interval for the difference between the two proportions. Enter 0.99 for this input to produce a 99% confidence interval instead and click Compute!. The results below show a 99% confidence interval for the difference between the two population proportions with "L. Limit" representing the lower limit and "U. Limit" representing the upper limit of this confidence interval.